The alpha-version is a functionally limited but ready-to-use test network of the DISCIPLINA blockchain. Thanks to DISCIPLINA, it will be possible to create a single profile, where users will store their verified data on both educational and professional achievements. Source code is avaliable on GitHub. Faucet — an instrument that permits access to a fixed amount of free DSCP tokens to facilitate transactions within the DISCIPLINA alpha blockchain and allows to create a paper wallet for their storage. Ariadne is a modern, standard-compliant, and reliable wallet for both casual and professional users with graphical or terminal-based interface. The GUI allows users to manage their funds, wallets, and do transactions with ease, and users in need of more customization will be able to use the TUI and its powerful Knit command language. Ariadne supports sending and receiving cryptocurrency, creating and managing wallets and accounts in those wallets. In order to use the Linux version, please make sure Flatpak is installed. 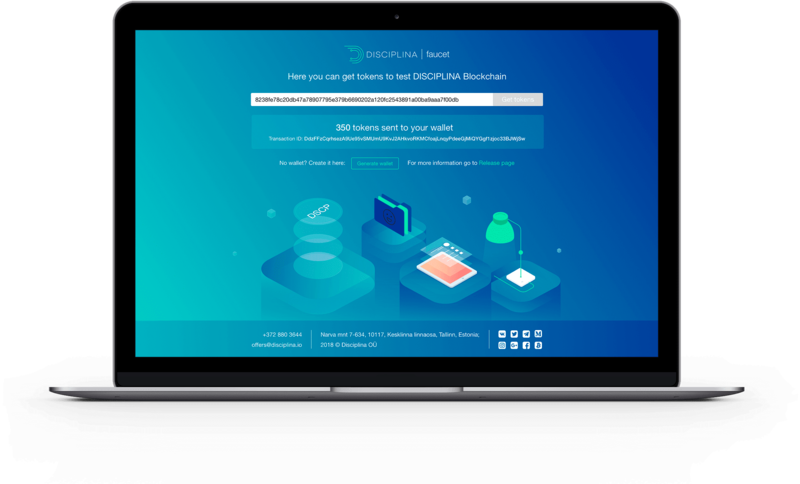 Block Explorer — an instrument that allows to find and track blocks of the DISCIPLINA network in real time, as well as to view their contents and the technical information on the transactions within it. This app allows students to interact with the DISCIPLINA blockchain. 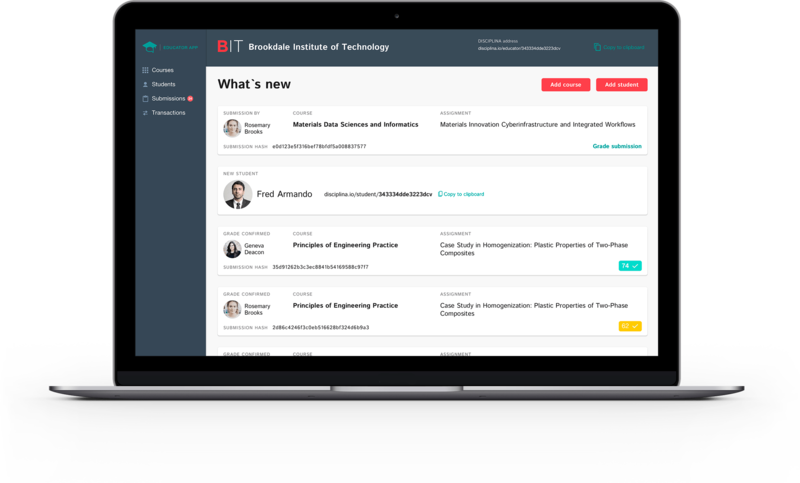 Here users can view their education and grade history and download their Fair CV container for recruiters. The app interacts with the DISCIPLINA blockchain via an open-source Node-API that allows to freely develop a Student app fork or implement the infrastructure in an already existing educational app. Application for educational institutions and teachers. 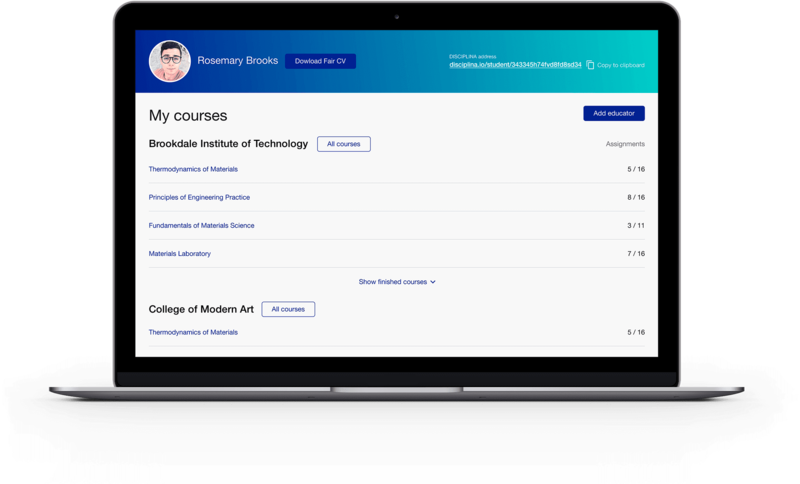 All information on courses and study programmes, students, their academic history and grades is transferred to the DISCIPLINA Blockchain via the Educator app. This app exchanges data with the DISCIPLINA blockchain via an open-source Node-API that allows any user to freely develop their Educator App fork or integrate it into an already existing educational app.